Moritz Moszkowski: Piece, Op. 45 #2 "Guitarre"
Joseph Joachim Raff: Morceaux, Op. 85 #3 "Cavatina"
"The Perlman Edition" celebrates the start of the violinist's fifth decade as a performer. Perlman has made LPs and CDs for several labels, not just for EMI Classics. Some would argue, however, that Perlman was at his best in the 1970s and 1980s, when most of the "Perlman Edition" recordings were made. The selections on this CD were recorded between 1972 and 1988. In spite of this range of sixteen years, there's consistency in the technical quality of the recordings, perhaps because most of them were digitally remastered in the 1990s. Almost half of these encores are arrangements made by Jascha Heifetz for his own use. Appropriately, perhaps, Perlman's tone is most Heifetz-like here in these selections. With Heifetz and his almost unremittingly brilliant tone, however, more than a few encores at one sitting were too much of a good thing, and the same could be said of Perlman when "channeling" Heifetz. When Perlman plays Kreisler, his playing is more Kreisler-like, and that's when Perlman the miniaturist is at his best. Listen to his Kreisler CD, also included in "The Perlman Edition" (EMI Classics 562601-2) and see if you disagree. Two of the Sarasate works have been arranged by Zino Francescatti, another violinist from Heifetz's era. Perlman's name can be mentioned in the same breath as Kreisler's, Heifetz's and Francescatti's. Among today's violinists, he seems to be the sole representative of what remains of the so-called "golden age" of violin-playing. In reviewing the Kreisler reissue, I suggested that Perlman's genius is captured in miniatures more than it is in the large-scale works. "Once again we are led to believe in the greatness of little things done well," was my comment. These encores play to the violinist's cooler side, and so I think they do not work quite as well. 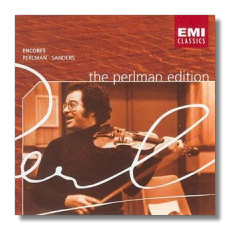 Still, Perlman is a master, and this CD is hard not to enjoy. Again, pianist Samuel Sanders unfairly receives no mention at all in the booklet note. He was no small contributor to the enduring success of these recordings.